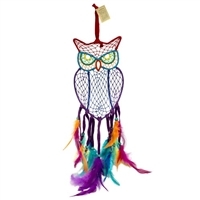 World Buyers offers a great variety of Wholesale Owl gift items available to the Trade. 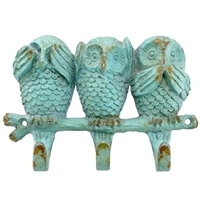 Select from owl paperweights, owl wall hangings, and even owl candles! Vintage owl mini matchboxes. Six designs in a pack of 60. Ceramic owl vase or planter. Teal, brown with wide white eyes. Sides wings are ecru (plant not included). Ceramic owl vase or planter. Grey & brown with wide white eyes. Sides wings are ecru (plant not included). Charming and Colorful Owl garland. 3.625 X 39"
1 dozen assorted royal owl coin purses. Metal clasp closure. Little mod owl coin purse. Metal clasp closure. Cute little ceramic owl planter. Gray with antique glaze. Does not have bottom hole. Ceramic nesting owl cups. 4pc set. Two set minimum. Order increments of 2, 4, 6, etc..
Made of PVC with look of honed white marble. 3 button batteries included. Each is packaged in clear counter-ready box with "Little Hooter" label. CLEARANCE Price shown nearly 75%% off! WHOOOO wouldn't like this darling owl box? Full of soft feathers and on the watch for passing dreams..
Paper and wood lantern with owls. Can be used with our black lamp cord kit YEA101. Just loop cord through wooden ring! Second image shows lantern with light bulb.+Hanger measures 10" - Tassels about 4" Clearance price shown now $50% off. These little owls have the cutest expressions! Each is handmade ceramic and uniquely painted. A small gift with an even smaller price! Assorted Dozen. Little hooter owl knob made of wood. Very cute! Clearance price shown 50% off . Lacey ring tray with little owl. Rustic antique white iron. This owl give a hoot about lights! A charming accent. Product Dimensions: 5.25x4.24x6.5"H Clearance price shown nearly 50% off. 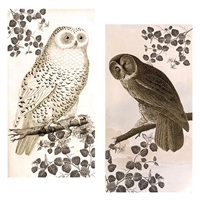 Matchboxes featuring vintage owl artwork. Each box has 50 matches with colored tips. 1 dozen boxes. Matches ship ground to continental USA only. No Canada or overseas shipments. 96 page leather journal with embossed owl designs. Black string tie. Natural paper inside!